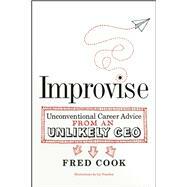 Improvise, by GolinHarris CEO Fred Cook, is an inspiring story of how Cook followed an unusual yet fascinating path from young adulthood to the corner office. Improvise combines Cook's lifetime of uncommon experiences with his insights from a successful corporate career, as a means to help recent graduates and young entrepreneurs uncover the professional skills that exist outside any traditional office. Fred Cook is the President and CEO of the award-winning public relations firm GolinHarris, where he has worked for over 25 years.